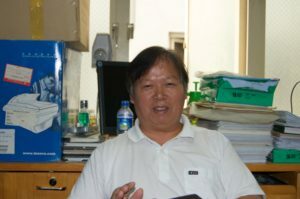 Herpetologist Rao Dingqi in his lab. Turtle at the Pan Long Temple. Journalist Peter Laufer is the James Wallace Chair Professor in Journalism at the University of Oregon School of Journalism and Communication. He is the author of Dreaming in Turtle: A Journey Through the Passion, Profit, and Peril of Our Most Coveted Prehistoric Creatures and Organic: A Journalist’s Quest to Discover the Truth Behind Food Labeling.